Hello and welcome back! Today is the last day of the Stampin' Up! Sale-a-Bration promotion. As usual, I didn't even get a chance to play with all the goodies that I acquired, but I do have one more post today with one of the fun items that is still available. Hello and welcome back! It's time for this month's Fancy Friday Blog Hop. I'm here with my fancy friends (all current or former members of the Stampin' Up! Artisan Design Team). This month we are CASEing (copy and share everything) a favorite sample from one of the current catalogs. You'll love what you see tonight on our fancy blog hop. We also have a Pinterest board that you can follow. You might have just arrived from Dani's blog. I just love her fun style, which matches her personality! Hello and welcome back! 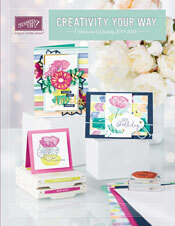 I have a congratulations card today featuring the Bloom by Bloom Stamp Set and stamping on Crumb Cake cardstock. I thought it would be fun to stamp some bright and white inks onto Crumb Cake, and adhered the results to a Thick Whisper White card base. I used Poppy Parade, Pacific Point, Old Olive, Crushed Curry, Balmy Blue and Craft Whisper White inks to stamp the flowers, leaves and dots with. I used the Banners for You Stamp Set and the coordinating Bunch of Banners Framelits Dies for the greeting in Pacific Point and Crumb Cake inks.